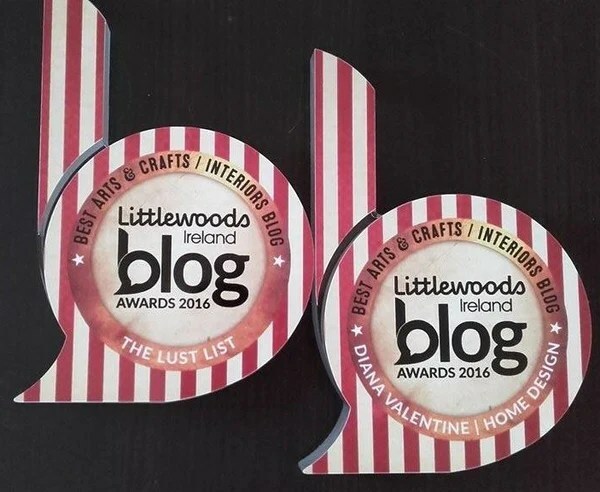 This autumn I delighted to be nominated for the Littlewoods Ireland Blog Awards 2016, along with other outstanding Irish bloggers, in the interiors and lifestyle categories. Being a finalist was in itself quite an achievement, and I was in awesome company alongside other beautiful Irish blogs I adore. The corporate blog I edit and manage also made the shortlist. So … I was over the moon to win two out of three: best arts, crafts and interiors Irish blog in the company and personal categories. In fact, best night of the year! Thank you, blog readers, visitors, friends, supporters, and Ireland Blog Awards judges!